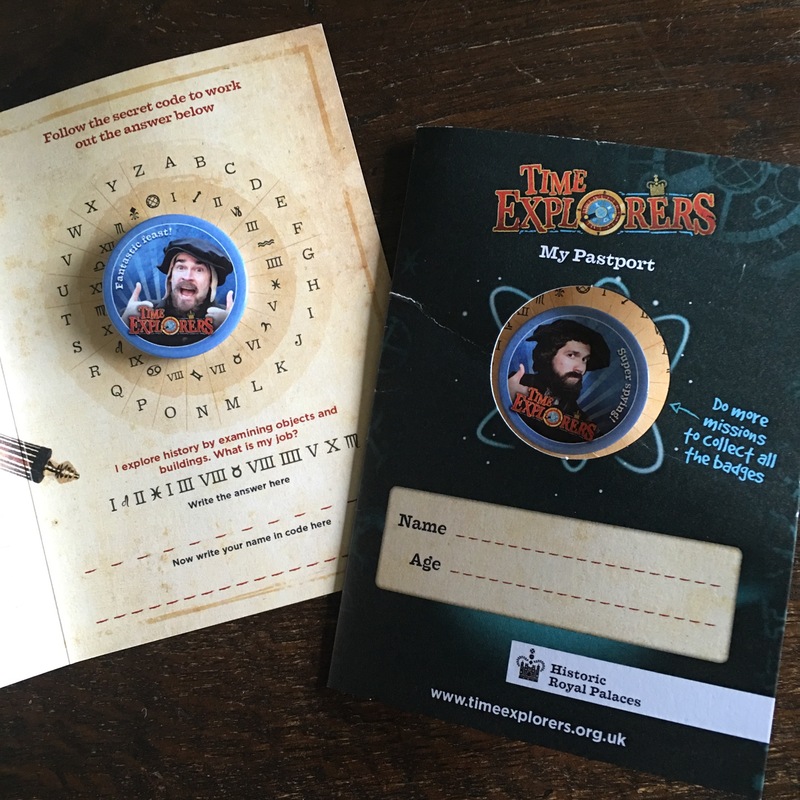 Time Explorers Pastport, can you decrypt the puzzle? To Hampton Court, to meet with Beatrice and Katherine, colleagues from Chartwell, my Marketing colleague Philippa and, from Historic Royal Palaces, Jane and Fenella. We looked in on some atmospheric live interpretation (this time not by Past Pleasures but a company of actors recruited for a more dramatic presentation of the Tudor apartments over the summer) but the main business of the day was to talk with them about their Time Explorers digital missions app, which I’d first encountered on a recent visit to the Tower of London. I’d blagged my way on to the visit, which Beatrice had organised, because I wanted to hear first hand the thinking behind the app. At a very basic level, its a children’s trail. Aimed at groups with children aged seven to eleven, it can be downloaded, prior to visiting on on the Palace’s free wifi (iOS only, at the time of writing), or picked up on up to 50 pre-loaded iPads, that the palace offers for free to visiting families, or at a reasonable charge to school groups. The same app offers three digital missions at Hampton Court, and another two at the Tower of London. There are plans to offer more content at both places, and eventually at the other Historic Royal Palaces. The app framework cost HRP around £200k to commission (from GR/DD), and each new mission will cost something like £10k-£15k to produce. This investment isn’t just in the app, but in the Time Explorers brand, which will widen to include other digital (on-line) content, printed trails and other activities on-site, and possibly even retail products. We each took a pad and split up to make sure we could cover all the missions. I took the architecture trail, and was charged by Vanbrough to help him assess the Tudor palace for renovation. As anyone who has ever done a paper children’s trail will agree, most are simply spotters’ lists – “can you see the (x – either historic feature/detail or partially hidden soft toy or similar anachronistic item)” – and within these digital missions there were indeed a few activities that followed along similar lines. I had to identify some of the creatures carved on top of the great hall for example. Using my favorite list of ludic motivation triggers, this is the basic acquisition trigger. There was an added twist in that if I claimed to see a creature that wasn’t actually there, I’d lose a “time gem”. I had five such activities to work through, and any wrong answers would cost a time gem. If I didn’t get any wrong then each activity would earn me five gems. This loss of time gems is what I’d describe as a challenge trigger. One of my colleagues valiantly got all her answers wrong to see if it was possible to lose all her gems, and it is, but game takes pity on you and returns one gem to avoid saddling parents with distraught (if unobservant) children. Not all the activities involved observation skills, some asked participants to speculate on behaviours, or the order of importance of things. And these arguably did little aid the stated aim of lifting children’s heads from the screen to look around them. But as they construct meaning in this way, then the learning trigger definitely kicks in. When they do look up, the environment offers them presence triggers, spectacle and sensation. Challenge returns at the end of the mission when the time gems you have retained define the number of seconds you have to get as many questions as you can right in a quiz, testing what you’ve learned so far. Here I found a bug. My architecture mission crashed when I tried to take the quiz. The application recovered very well and I hadn’t lost my progress in the mission, but every time I tried to take the quiz, it would crash and recover again. In the end I took another mission, and completed that quiz. The number of correct answers to got are added to the number of gems to retained to give every player grade from bronze to gold. A nice acquisition trigger, and then you can claim your Pastport and badge (again, acquisition) as pictured above. It a nicely considered decision, if you complete more missions, at any palace, you can collect the relevant badges to add to your pastport. I did try that architecture quiz again, and having completed the second mission and quiz, it didn’t crash, but repeated the second mission’s quiz! The badges have given me plenty to think about for my Opposites Attract challenge, which I’ll consider over the weekend.